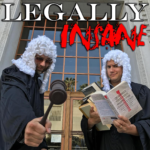 Building off of Kayne West’s recent interview regarding the 13th amendment, Matt and Tony have a few laughs and dissect the topic of modern day slavery. They review some of the countries worst prisons in the Southern United States and talk about the how the privatization of jails came about. Throughout history, the state leased convicts out to wealthy investors to work on railroads, in cotton fields and mine shafts. [02:25] – The ultimate troll, http://www.brettkavanaugh.com. [06:26] – The 13th Amendment abolished slavery. [07:05] – Kanye was trying to articulate the idea of getting rid of modern day slavery. [08:30] – Shane Bower goes under cover. [10:20] – Before the Civil War the majority of prisoners were white. [10:58] – Cotton King convinces the state to lease him convicts. [17:26] – In 1870 in Alabama, more then 40% of their convicts died in mining shafts. [21:32] – The Louisiana State Penitentiary is named “Angola” after the former plantation that occupied this territory. [24:40] – Some US states are starting to expunge misdemeanor marijuana offenses from people’s records. [26:37] – The Fifth Risk by Michael Lewis. [29:40] – Obama tries to help Trump’s team transition and nobody shows up to the meetings. The Takeaway – The 13th amendment has a weird loophole that allows modern day slavery.